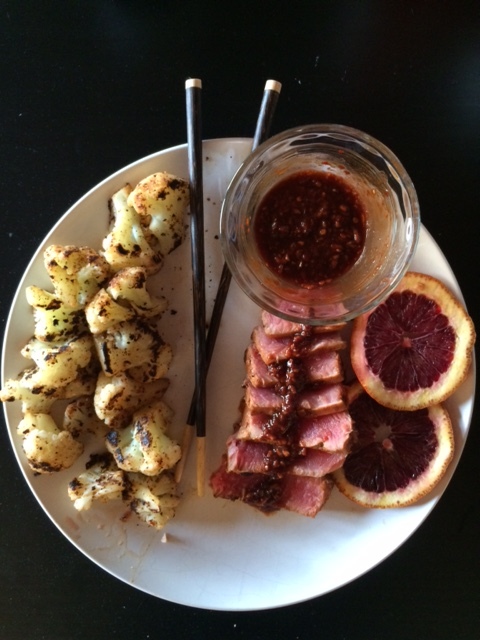 Blood oranges are one of my favorite fruits. I’m not sure if it’s their vibrant color or their amazing flavor (think citrus and raspberry all in one! ), but either way they’re delicious. The big problem: They’re a winter fruit, and I always want to use them in the spring/summer. So I buy them when they’re in season, but by the time I go to use them, they’re bad. That’s not happening this year! I’m putting them to good use. So here’s a delicious recipe that’s healthy and flavorful. If you don’t have blood oranges or access to blood orange juice don’t worry! You can use any kind of oranges, and you’ll get a great result. -1 clove garlic peeled and minced. -2 tsps of olive oil or non-stick spray. (I have an olive oil sprayer) Admittedly the tuna will sear a lot better with olive oil, but if you’re looking to cut out the calories use the spray. Take a small saucepan. Mince the clove of garlic. Zest half of a medium-sized blood orange. Add the soy sauce, garlic chili sauce, minced garlic, orange zest. Cut the orange in half, and squeeze the juice from one half into the sauce pan (you can use the other half for garnish or if you’re making multiple servings). Put the pan on high heat. Stir Occasionally until it reduces and thickens. Remove from heat. Take the tuna steak. season with salt & pepper. 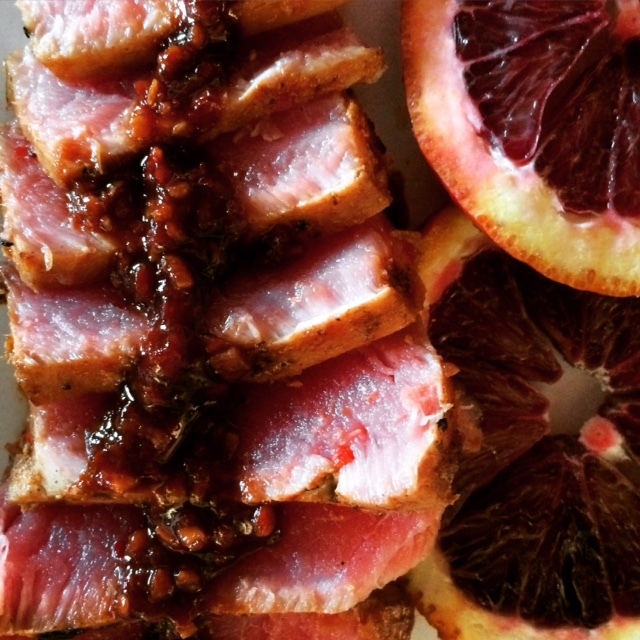 Take the blood orange glaze and brush it onto the tuna. Heat a frying pan with the oil or non-stick spray. When Hot add the tuna. Let cook for 30 seconds on each side. Remove from heat and let rest for a few minutes. Take the rest of the blood orange glaze. It will now be very salty and thick. Add about a teaspoon of water and mix to dilute. Now you have a great dipping sauce!!! Slice the tuna and serve. I added some cauliflower as a side. Hope you enjoy!